Designed by the Strobe Tuning Hardware Experts with 60 Years Experience: Peterson Tuners. Now, the only reason to sound out of tune is because you want to! Peterson introduces StroboSoft™ - the world's first strobe tuner for your Mac or PC that utilizes the power of your computer to provide 0.1 cent accuracy tuning for your fretted or unfretted, stringed instruments. Tune brass and wind instruments using an external microphone or pick-up device as well. 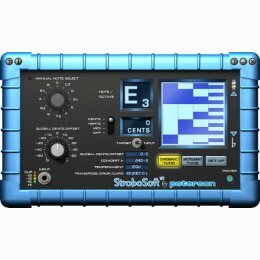 StroboSoft turns your computer into a Peterson accurate hardware tuner that you can use in the studio or on the road! Create instrument profiles that include your instrument type, its selected tuning, as well as transpose or drop settings. Plus, with the capability to store unlimited instrument profiles, you can add new tunings and save them under your own custom names for quick recall between live sets on stage or switching recording projects in the studio. Just use your notebook's built-in mic or plug in a microphone and start tuning. Use StroboSoft to adjust more than just your tuning. Save time and money by intonating your electrics at home. Intonate your electrics quickly and easily using StroboSoft's Visual Intonation Guide. The built-in INTONATE function will visually assist you while intonating your instrument. The LED on the selected string will fill with color when you are in the proper octave; just isolate the strobe display after that and you're done! Even if you have never used a strobe tuner before, StroboSoft's large, easy to read screen makes tuning simple. Now, sound out of tune only because you want to. With 52 preset alternate tunings on-board (Deluxe only), take your tuning to the next level and get the sound you are looking for. Use the multi-function window (under note display) to view information on the note you are tuning such as MIDI note number and frequency value. See how far you are out of tune instantly with the real-time cents display that outputs how many cents you are out with 0.1 cent resolution. Pitch Accuracy: 0.001 semitone (0.1 cents). Note Range: Eb0 (MIDI note 15) to Eb8 (MIDI note 111). Frequency Range*: 20Hz - 5000Hz. Input Calibration Signal: Accepts any calibrated signal in the range 80.0Hz to 2080.0Hz. The calibrated frequency value can be set in 0.1Hz steps. Calibration Factor: 90.000% to 110.000% in 0.001% steps (manually entered or by measurement). Global Cents Offset: -50.0 cents to +50.0 cents in 0.1 cent steps. A440 Reference Frequency: 340.0Hz to 540.0Hz in 0.1Hz steps. Transpose/Drop/Capo: -12 semitones to +12 semitones in 1 semitone steps. Manual Note Select: C0 to C8. Measured/Target Frequency: Displayed to 0.01Hz (up to 999.99Hz), 0.1Hz (1000.0 and above). Measured/Target Cents: Displayed to 0.1 cent, or 1 cent, depending on user setting. Temperaments: Contains 12 built-in temperaments (including Equal Tempered). Unlimited user temperaments (Deluxe version only). * Frequencies and notes can still be measured below 20Hz and above 5000Hz, but the accuracy obtained may not be as good as stated above, or may depend on input device characteristics. Processor: 1GHz Pentium or equivalent. RAM: 256MB of RAM (512 MB Recommended). Audio: Sound card with mic/line input. Video: True Color 24-Bit capability. Hard Drive: 30MB of Hard Drive Space for installation (STD & DLX versions). ProTools HD™ users: The DigiDesign® drivers will not allow any other application to use the audio device even if ProTools HD®is idle. Therefore, it is not possible to run ProTools and StroboSoft™ side-by-side and use the same audio device. You can only access one at a time or use your stock sound card as a dedicated input to StroboSoft. ProTools LE™ users: ProTools LE™ users on PC can only access the first two inputs of the audio device. We will address this in a future release version of StroboSoft. ProTools LE™ users on Mac OS X 10.3+ can access all inputs. Motu™ users: On Mac, some Motu cards will not exhibit their inputs correctly in StroboSoft. We are currently working to resolve this issue. This is not a problem with other DAWs. One purchase warrants two installation permissions every 120 days for a maximum of six unlocking codes per year. If more than two installations will be required immediately, please purchase a second copy of StroboSoft. Due to digital copy-right laws, software is not returnable. Please read all specifications and requirements before purchase. Any questions may be directed to info@strobosoft.com or by calling Strobosoft directly at 708-388-3311.